What is break power of Steam Engine? Break power measurement at steam engine is the difference between indicated power and fractional power.The useful power available at the crankshaft in the engine is called break power(B.P. ).The power developed in the engine cylinder known as indicated power (I.P. ),is not fully available at the crankshaft for doing necessary work.some power loss is observed to overcome the internal friction (called fractional power) of the moving parts of the engine. Generally, break power at the steam engine is measured by dynamometer.There are many types of dynamometer available in the market. But absorption type dynamometer is used to measure the break power of the engine.Absorption type dynamometer are two types. Prony brake dynamometer is the simplest form of absorption type dynamometer.This type of dynamometer, a pully which is connected to the engine's shaft to measure the breakdown.Two wooden blocks are placed around the pully and these blocks are clamped by two nuts and bolts.A helical spring is provided between the nut and the upper block to adjust the pressure on the pully to control the speed.A long lever is attached to the upper block and it carries suppose a weight 'W' at the outer end.A counter weight is placed at the opposite side of the lever to balance the unbalanced break power of the engine.Two stops 'S', S is used to limit the motion of the lever. When the brake is in operation, the lever is located with a load suppose 'W' see in the diagramand the nuts are tightened until shaft runs at a constant speed and the lever is in horizontal position. This condition weight 'W' must balance between the blocks and the pully. W = Weight at the outer end of the lever in newtons. l =Horizontal distance of the weight W from the centre of the pully in meters. N = Speed of the shaft in r.p.m. It is a common method to measure the break power of steam engine, called rope brake dynamometer.This type of meter, one two or more ropes wound around the flywheel or rim of a pully fixed rigidly to the shaft of an engine. The upper rope is used for balancing and a lower rope is kept in position by applying dead weights, see the line diagram. In order to prevent the slipping of the rope over the flywheel, wooden blocks are placed at intervals around the circumference of the flywheel. In the operation of the brake, the negine is made to run at a constant speed. 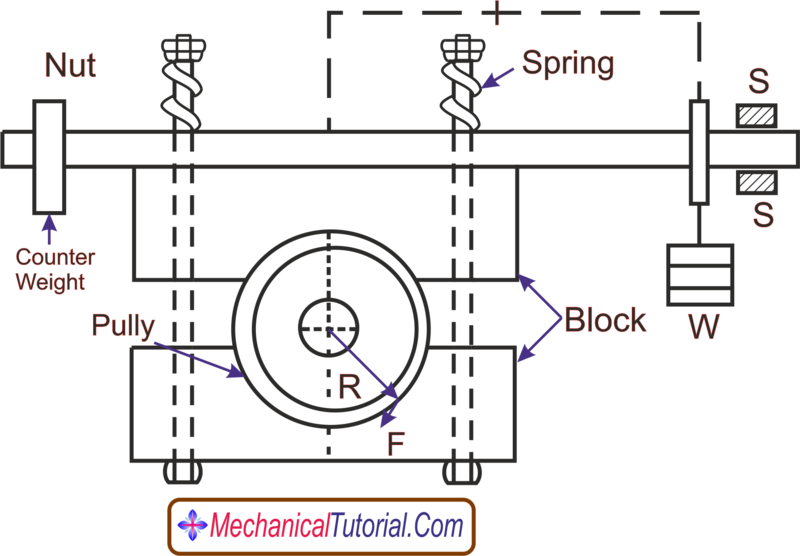 The frictional torque, due to the rope, must be equal to the torque being transmitted by the engine. N = Speed of the engine shaft in r.p.m.